Shock value is no stranger to entertainment. In fact, it’s become more and more customary in order to keep the masses engaged. The Amoralists too, are no strangers to presenting gritty theater that reflects the American condition with a tinge of complexity. 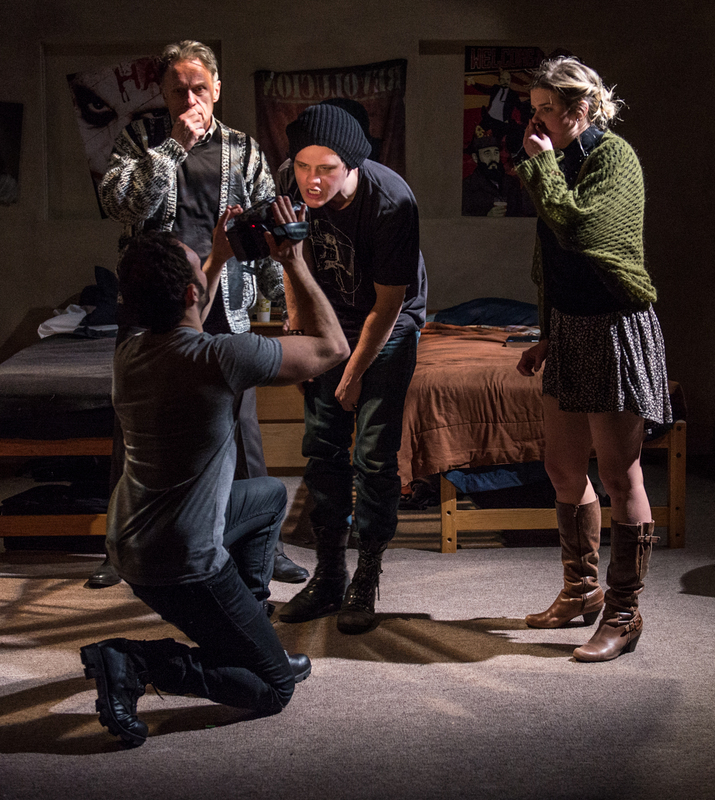 In their production of Lyle Kessler’s Collision, we find ourselves watching three students, a professor, and a stranger reflecting on just that, ending with a shock that leaves you questioning everything you just saw. Collision follows the chance encounters of five individuals who set forth on a mission to create order of chaos. The result is catastrophic. The entirety of the play takes place inside the dorm room of two college students, Grange, a self-involved philosophical intellect, and Bromley, a kid who just wants to find something to live for. Luckily, this random pairing of roommates couldn’t work out better. They both get something from each other. Grange gets a movie-making “partner in crime” out of Bromley, and Bromley gets a purpose and a friend. On the way they meet, and through persuasion both sleep with, the innocent and pure Doe and Grange’s philosophy teacher who won’t call on him in class, Professor Denton. Doe and Denton are brought into the half scripted, half documentary scheme that slowly turns into a hatefest of society. When the fifth member of the story, a gun dealer named Renel enters the picture, we soon learn that this movie is a little more realistic than anticipated. Grange purchases four guns, and ammunition to match, that are believed to only be props, but by the end of the play we discover that they’re not for play but for action. Foreshadowing that Chekov could have predicted. Kessler has written a play that presents four socially disregarded individuals who make it their mission to make a change. Through high-intellectual dialogue, occasionally laced with subtext, the four characters’ journey of discovery is clear but their reason is muddy. When they reach their climatic execution, pun intended, the justification for their action is missing. The reason could be the unfortunate lack of backstory and history of the characters. We learn little, if not anything, about the characters that would lead them to shooting up the not-so-innocent, as they believe. All we really know about Grange, Bromley, Doe, and Professor Denton is that they are incredibly intelligent. We know more about Renel, who appears on stage for a very short amount of time comparatively, and his history, making him one of the more interesting characters in the piece. Despite the lack of character, there were some wonderful performances. Craig ‘muMs’ Grant as Renel was tremendous as Renel, bringing perseverance and trust to the fateful gun dealer, our “in” to the world of the play. Nick Lawson packed heart into the ill-guided Bromley. Director David Fofi guides the troupe with precision and intention despite the missteps in the script. Alfred Schatz’s set evoked the quintessential college dorm room. One of the odder design choices in Collision was Evan Roby’s lighting design. The play, for the most part, is a realistic play but there were moments that the lights became moody and without any practicals, the design didn’t quite work. The overall theme of Collision was bold choices. And nothing was bolder than the end of the play, a gun spree sound cue. The play brought quite possibly the biggest news story in the national spotlight right now into action. Having it be the final moment of the play, it is bound to be the most talked about part of the play. I am always a fan of bold choices, but personally, this choice did not sit well with me.